We’ve recently been conducting some reverse engineering and vulnerability analysis on an Anti Virus (AV) product and wanted to attach Rohitab API Monitor to one of the AV’s running processes so that I could log the Windows API function calls in order to better understand how the AV was implemented. This is the post patch guard method of allowing the AV driver to intercept calls to ZwOpenProcess, amongst others, so that access can be denied to the process handle, or the returned handle can be given less access rights etc. 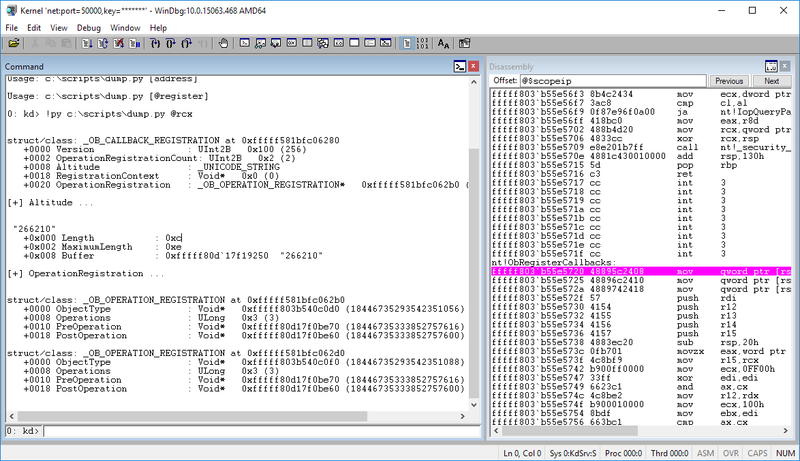 The OB_CALLBACK_REGISTRATION and _OB_OPERATION_REGISTRATION structures are not defined in the Microsoft public symbols, so the WinDbg command x nt!_OB* doesn’t help. Both structures are well documented on MSDN, so after intercepting the function call to ObRegisterCallbacks in WinDbg I started decoding the structures by calculating the offsets and dumping memory addresses. After a couple of debugging runs, this soon becomes tedious; my heart sank when I thought I might have to write a WinDbg script to automate the process. If you’re like me and you don’t use WinDbg scripts that often then you will know how time consuming it can be to re-learn WinDbg scripting each time you need it. 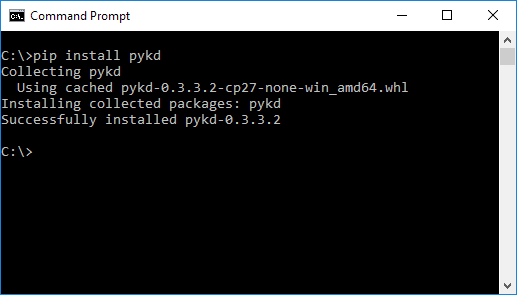 Then I remembered pykd, a python scripting module for Python, which I had heard about but never tried. We can create an instance of a type using the typeVar function which takes parameters typeInfo and address. In pykd an address is simply an integer. Once we have a typeVar instance, we can dump the information in a similar way to using dt nt!_ _OB_CALLBACK_REGISTRATION <address> (if the symbol was public), by casting to a string. Dumping the data in this way doesn’t recursively dump the information, so the output can be improved by iterating over the OperationRegistration array and individually dumping each item. Executing the script, while on a breakpoint at nt!ObRegisterCallbacks gives the following output. +0x008 Buffer : 0xfffff80d`17f19250 "266210"
Specifying True for the second parameter will output DML. If you don’t want to use python/pykd then other options are available. Here are two of the most recent ones.